We are continuing to wrap up outside work. E! 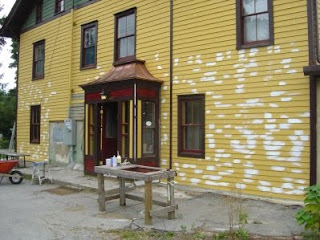 started to touch up the outside paint. In the last two years we learned a thing or two. For instance, even if you prime pine wood, the knots will come through sooner than later. So today E! reapplied primer where the knots started to show. 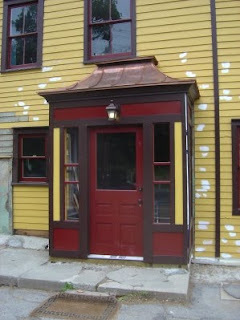 At long last, I reinstalled the front door. I was tired for a while now of using the screwdriver to open the front door, i.e. remove the plywood. 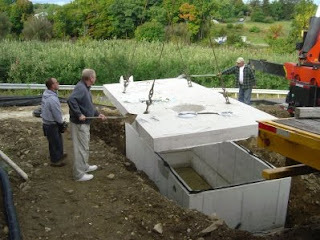 One of the highlights of the day was the delivery and installation of the septic pump chamber. It holds only 4000 gallons (as opposed to the 4500 gallons the septic tank holds), and therefore may be only big enough to house an Oompa Loompa family with 23 kids. I spare you the many pictures I took, because they pretty much show what happened during the installation of the septic tank.